I started in 2008 totally by accident. I was looking for an iris folding kimono template that I could only access if I joined OSA. I had no intention of really involving myself in the group but then I started receiving group emails showing the beautiful work members were doing with stamps so I gingerly dipped a toe into one or two swaps. I’m still gingerly dipping a toe but I have learned so much from everyone here and have made some delightful contacts that I’m glad I joined. Is there such a thing? Basically anything that produces lots of colour. I love colour! I use AAA a lot because Annette is so generous with her specials and give aways. However any company with beautiful stamps will attract me and any spare cash I have hanging about. I love plant and animal stamps so if they are Asian they are likely my favourites. Though I’m not a real fan of cute so Hello Kitty wouldn’t work. My small quilting square. I love that thing. It helps me line up my pieces of paper so they are relatively straight and because it’s transparent I can really see what I’m up to. I’ve even had occasion to use the 45 degree angle aspect of it for cutting bits and pieces. And of course paper. Lovely, exotic, textured paper or plain jane paper, it doesn’t matter I love it all. Can’t say that I have a favourite. That said I really like glittery things, paper cutting and mizuhiki cord so the potential to have one of those on my cards would be possible. Again another difficult choice. I would have to say my Xacto knife. I use it for cutting, obviously, but also for lifting the backing off double sided tape, nudging bits into place, scraping gunk off of things etc. More useful than I thought! You’ve heard most of them before and they are still worth remembering. Go outside your comfort zone, use colours you’ve never used or have seen other members use that appeal to you, check out the galleries. I like and appreciate the skill of some artists to evoke an image with a minimal number of strokes. The simple lines make it look so easy but my mind and skill level can’t achieve it. I would like to attend one of the big stamp shows that go around, something like the Heirloom one. Though I think I’d burn out from stamp overload pretty quickly and I doubt my wallet would be full for long. OSA is my one and only stamping list. I’m not much of a joiner and what I’ve experienced with the members here is wonderful. I have a number of Nancie’s VSN magazines that are full of great information. The other magazine I refer to often is Return to Asia by Stampington and Company. I am all over the map when it comes to paper craft interests though currently paper cutting is a highlight. But origami, paper quilting, paper quilling, iris folding (which is how I found OSA originally) are all interests. I used to sing with an a capella vocal jazz group which was a lot of fun but due to life changes for a number of the members we disbanded. I would love to teach my 2 Alaskan Malamutes how to mush but have not found a teacher as yet and as I’m pushing 60 I want them well trained before I head out on the road. I don’t wish to find myself heading into a ditch when the dogs spot one of the numerous bunnies we have around here. Photography is another interest and I’ve even liked some of the shots I’ve taken. I especially like close ups. Nature plain and simple. I love the change of the seasons, the wealth of natural objects that make themselves available for arts and crafts, the colours, the textures, the beauty. Birch bark, arbutus bark, moss (which, depending on the type of moss, makes great under sea kelp for cards). I like Stamp Zia, Michelle Zindorf, The Born Doodler, Fred Mullett and will always check out anyone recommended by the group. I do. I work part time as a Registered Massage Therapist. I’ve been a RMT for 27 years and part time is just perfect for me now. Family consists of my DH and DD. My DH and I live on 2.5 acres of woods and pasture on Vancouver Island, B.C., Canada. It suits us to a T. We have abundant bird life, a wide variety of trees, and a really good life. Our daughter is 27, works down island in the capital city of Victoria and has mad skills in the kitchen and with a camera. Our household includes our dogs, Rune and Lodden, and our 2 sister cats, Andromeda and Celeste. We are also constantly visited by our neighbour’s 2 sweet and friendly hens whose names, if they have any, are unknown. The central area where the main image is measures 6.5 inches x 3.5 inches with a half inch border all around. This leaves a quarter inch edge of bare cloth around the border. I stamped using a black dye ink and coloured with acrylic paints and acrylic pearlescent inks. In some cases I stippled, for the dragon I used gel pens to colour with and in one I simply used a flat brush to apply the paint. Whatever works for you is what’s best. I then went back and, using a fine tip Sharpie, highlighted aspects of the stamped area to give it a little more definition. I placed a 3.5″x 6.5″ piece of cardboard over the main area and used a regular tip Sharpie for outlining the border, measured half an inch from that border line and drew the outside edge. Leaving the cardboard in place to protect the image I then placed a strip of paper on the outside edge of the border so I could stipple my colours on, stay within the lines and not make too much of a mess. The kanji for the elements were found online and copy and pasted into a word file, sized to my needs, and printed off. I then taped them to some heavy card and cut them out with an Exacto knife to use as stencils. Again using a stipple brush I coloured them using from one to four colours. 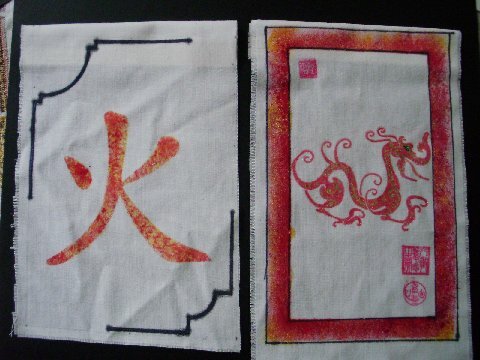 The borders I used on these are from a stencil I bought at a garage sale. 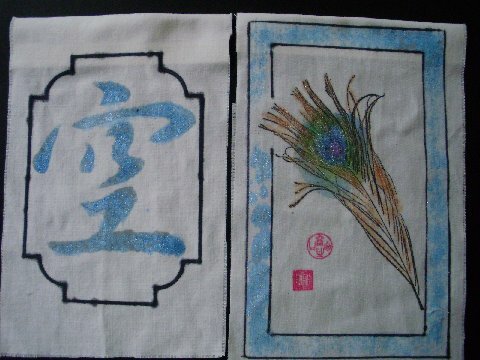 Brushes: Stipple, small flat and pointed chinese brush. The order of flags is fire, air, earth and water. The other photo shows paper mock ups, mistakes and some finished products. Linda, this is such a great project! Thank you so much for sharing it with us, both the finished product and the story behind it. Congratulations, and thank you for being our SAM for thismonth. Congratulations Linda! Fabulous project. Enjoy your month as SAM! Really glad you found osa you are an asset to the group. Love your project. Congratulations, Linda. What an awesome project. 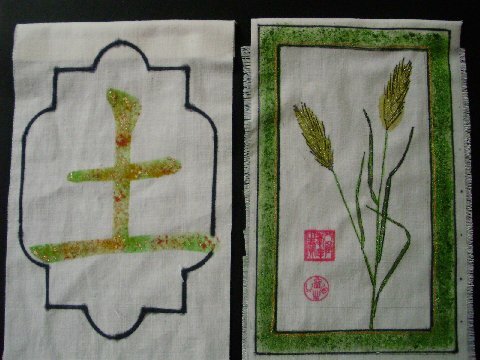 Love the idea of prayer flags. Amazing talent! Lurking, briefly, I found this today. I’m not at all surprised by your wonderful project. Nor am I surprised by how perfectly and meticulously you created each piece. I’m definitely not surprised to find you Artist of the Month – I’m just surprised that it took so long for you to be here. Your art is always innovative and thoughtful, creative and beautiful. Your posts are informative and entertaining. You are a really special jewel among the many who make up the OSA family. I shall watch the trees, and go outside to capture a breeze. And I’ll find your prayers on it, I’m sure; and I’ll smile. 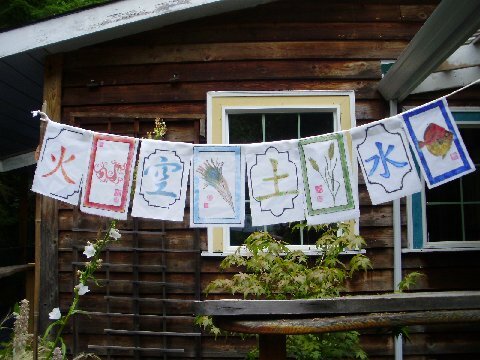 Linda, your prayer flags are amazing and beautiful and are the perfect project for September when fall approaches and the winds flutter gently. I was excited to read about your project and how you created your individual flags. CONTRATULATIONS! Wonderful project Linda and so inspirational! Very beautiful indeed! Congratulations on being this months SAM, it’s lovely to see your work on the homepage! Bravo! WOW! What inspiring project(s)! Innovative to say the least…beautifully done. I know you will enjoy your month as SAM…paper hugs coming your way! PS would love to see some of your iris folding…it’s one of my favorite techniques!!! Sorry for my late Congratulations. I am getting back into sharing with the group and I was so happy to get to know you more and see your lovely project. I like to think of good prayers on the wind for all creatures.